Hibiscus produces large, exotic-looking flowers that only bloom for one day before dropping off. However, the calyx that is left behind after the flower blooms has both medicinal and culinary value. 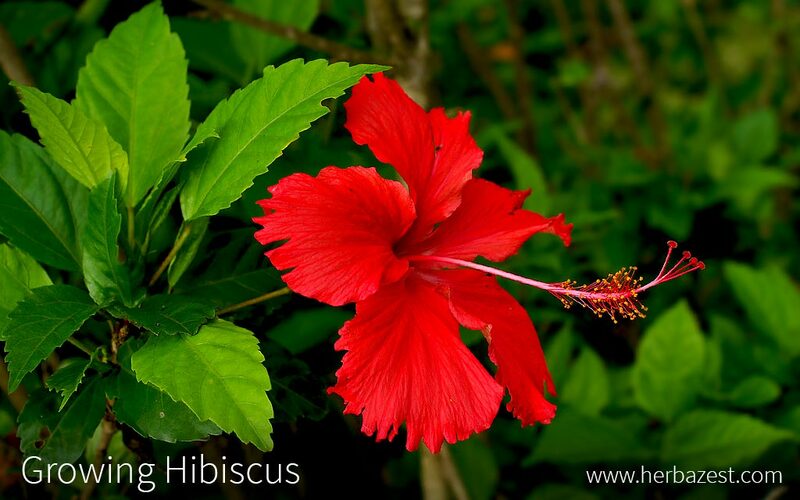 Hibiscus, a member of the Mallow family (Malvaceae), is relatively easy to grow under the right conditions. It is a plant that is native to warm, tropical regions, but is grown and bred all over the world as a result of its ornamental value. For best results, plant hibiscus in well-draining soil with a mix of potting soil, peat moss and vermiculite. Be sure to perform a soil test before planting hibiscus, in order to better understand the nutrient content. If the soil quality is poor, amend the soil with a small amount of compost. Hibiscus is best cultivated from cuttings of 3 - 5 inch (8 - 13 cm) taken from a strong shoot. It is recommended to dip the cut end in a rooting mixture before planting it in an appropriate rooting medium in a pot. Keep the soil around the cutting moist and in a well-lighted area. Once the cutting has developed a substantial root system (approximately three to five weeks), it can be transplanted to its permanent location. To encourage bushier growth, once the plant has become well-established, pinch off the top inch of the hibiscus stem. While hibiscus grows best in moist soil, and though it is somewhat drought tolerant, the soil should not be allowed to become saturated or to dry out. Water less frequently during the winter months. In addition, limit the water to the root system and avoid soaking the foliage in order to prevent diseases. As a general rule, hibiscus must be provided with approximately one inch (2.5 cm) of water every week. Hibiscus will require a balanced fertilizer at approximately half the label-recommended amount every two to three weeks during the summer. The plant will need less fertilizer during the fall. It is not necessary to weed around hibiscus too often. Add a layer of mulch around the base of the hibiscus plant to conserve soil moisture and prevent weed growth. There are a number of insects that can attack hibiscus, including aphids, scales, mealy bugs, thrips, and mites. Many of these pests can be controlled by periodically washing the hibiscus plant, using insecticides, and removing and destroying affected parts of the plant. However, hibiscus is relatively tolerant to infestation and will continue to grow despite the presence of insects. Hibiscus is very susceptible to leaf disorders. For that reason, it is important to avoid soaking the leaves when watering hibiscus. Some common foliar diseases include powdery mildew, downy mildew, and botrytis. Many foliar diseases will cause the hibiscus leaves to turn yellow or take on a mottled green appearance. Appropriate herbicides may be applied, but try to identify the source of the stress before using chemicals. The harvested part of the hibiscus plant is the fleshy calyx, the sepals of the flower that enclose the petals and protect the bud before it opens. The calyx should be harvested soon after the flower has dropped and before the seedpod has dried and opened. The longer the seeds are allowed to ripen on the plant, the more susceptible the calyx is to damage from the sun and other deterioration. For that reason, the calyx should be harvested as soon as possible after the flower has dropped. Hibiscus calyces should be harvested by hand, taking care not to allow them to come in contact with any contaminated surfaces, including the ground. As soon as possible after harvesting, the hibiscus calyces should be dried. There are many different methods of drying. Spread the calyces on a screen or frame in an area with adequate ventilation. Once they are dried, store them in an airtight container under dark, cool conditions. Fresh hibiscus can also be frozen for later use.